RHINO Gear is a Gear Set in The Surge. "Heavy tasks just got a whole lot lighter! RHINO gear was the first generation of CREO Exo-Rig technology, built for exceptional power and durability in the face of extraordinary demands. But don't be fooled by its age - RHINO is still the backbone of CREO's mission to restore the environment, having paved the way for the more task-specific gear to come." 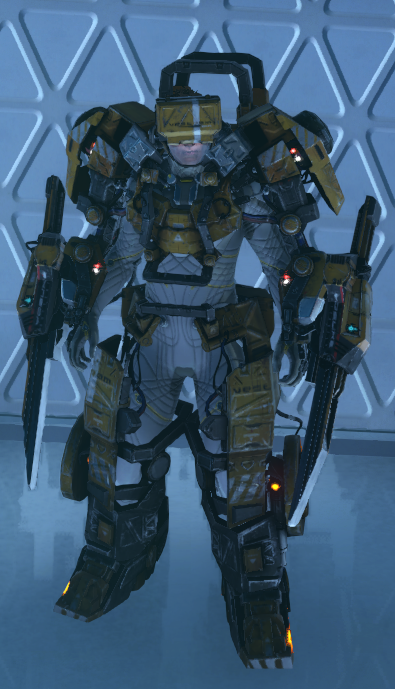 "Wearing a full set of RHINO gear grants increased impact while under the effect of implants that boost your weapon damage." RHINO Gear is worn by some enemies in the Abandoned Production and by most enemies in Central Production B. The RHINO Gear costs less in terms of materials and provides a slightly higher defense than the ANGEL VI Gear.